The top layer consists of sun dried natural green moss from a sustainable resource. With this decorative top layer you can actually create the soft floor covering found in natural tropical forests. The sun dried green moss provides a soft layer for animals to burrow and cover their secret hideout. Most reptiles and amphibians forage the forest floor in search of food and water. The top layer covers the actual substrate underneath to facilitate its moisture retention and prevent the soil from drying out. The biodegradable moss is absolutely free of chemicals and can be safely composted in your garden. The base layer consists of rich organic matter from sustainable ground coconut husk fiber. It is a 100% natural, ecological and biodegradable substrate with great hygroscopic properties. This base layer makes an ideal substrate to create natural planted terrarium set-ups for humidity-loving reptiles, amphibians and invertebrates. Its water retention, natural rooting hormones and anti-fungal properties promote plant growth in your terrarium. 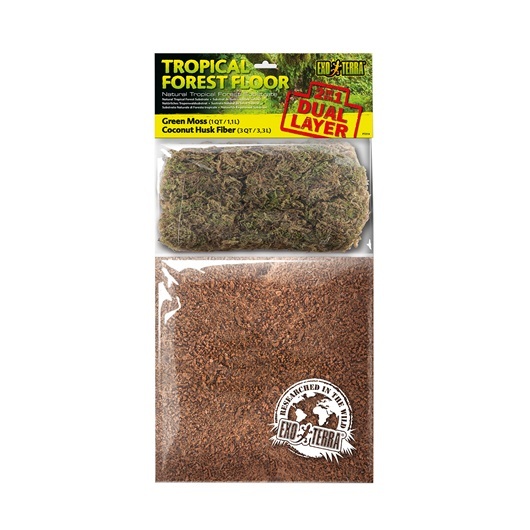 The unique coir pith used for the Exo Terra Tropical Forest Floor consists of a mixture of short fiber and coco-peat grain sizes ranging from coarse granules to fine clumps resulting in improved soil drainage and healthy plant root aeration.